Save the date for Real Ale's 22nd Birthday! Each 21+ person who pays for a ticket will receive four drink tokens. 1 specific token will be redeemable for a Real Spirits Gin or Whiskey Cocktail! If you're not into cocktails, you can use all 4 tokens for beer. 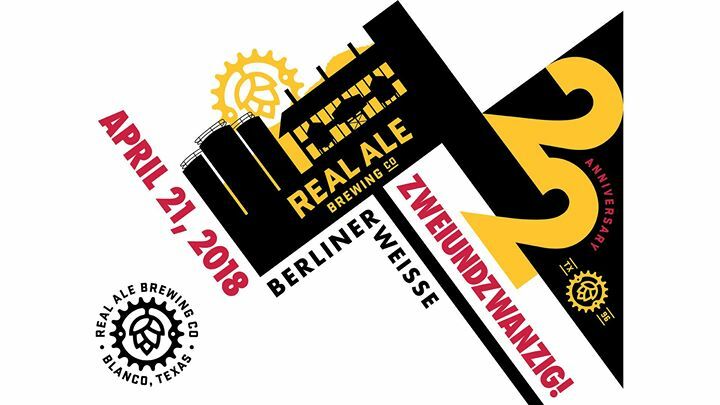 Real Ale is turning 22, and you're invited! We're throwing another iconic Real Ale anniversary party, which means beer, food, music, and (for the first time ever) cocktails! This year's anniversary beer is known as "ZWEIUNDZWANZIG" (Twenty-Two in German)- it will be a crushable, refreshingly tart Berliner Weisse.